Another interesting fourfold that I discovered while reading mathematical physicist John C. Baez’s blogs Azimuth and This Week’s Finds in Mathematical Physics concerns the notions of system dynamics and bond graphs. These concepts generalize the fourfold of the basic electronic components into other types of physical systems, such as mechanics, hydraulics, and to some extent even thermodynamics and chemistry. The types of systems that can be modeled by system dynamics are described by two variables that vary functionally over time and their corresponding integrals. 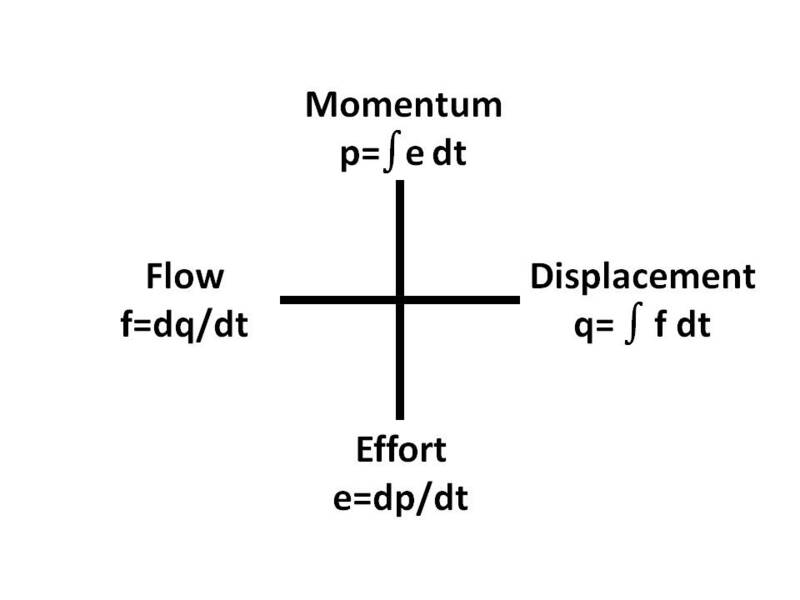 These four functions can be thought of as flow and effort and their respective integrals displacement and momentum. This entry was posted on April 2, 2012 at 10:08 PM and is filed under fourfolds, Mathematics, Science. You can follow any responses to this entry through the RSS 2.0 feed. You can leave a response, or trackback from your own site.